Standard acknowledgement email sent to Mr McWilliams. Email forwarded to MCHC members and others. Printed by the Rockdale Reporter - Contributed by the Milam County Genealogical Society. Georgia, Alabama, Mississippi and East Texas. 1880 on four acres of land that had been donated by Travis Shaw for a church and a cemetery. The first person buried in the new cemetery was a child named Merriweather. Travis Shaw also donated four acres of land for a school in 1883. The first school was a subscription school. It was taught by Miss Mollie Phillips. Years later, in 1917, a new two-room school was built. From that time on two teachers were employed. added much to the social life of the community. consolidated with Rockdale school and the children were bussed into town. still stand. A few people still bury their dead in the cemetery. and former citizens, who are now too few in numbers." in assuming that they were great grandparents?. 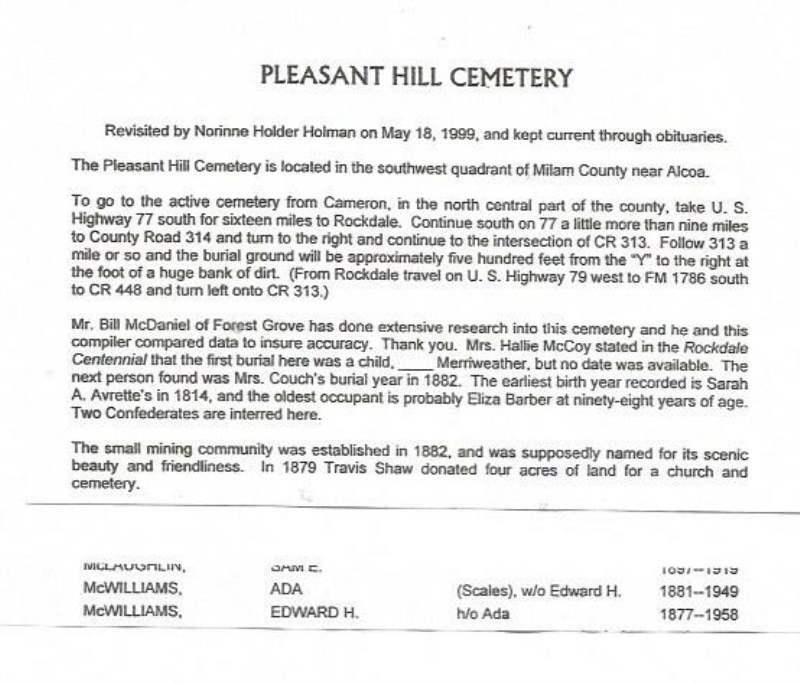 I also noted interred in the Oakhill Cemetery is Lillie B. McWilliams, 1914-1992 and husband Logan V.
You might also enjoy this article about an adjacent mining community that struggled keeping a name. Thank you for the information. My family from that Rockdale was Montague. My great grandfather was a postman. Lee and Ruth Wallace were the relatives I knew, both buried across the street from their old house in Minerva.